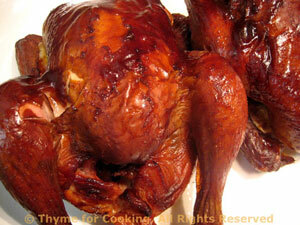 Barbecued Cornish Hens, Thyme for Cooking easy summer main course. If you get one, larger bird, you can cut it in half to cook faster (serving will be easy) or leave whole and add 10 - 15 minutes cooking time. Tie legs together with kitchen string and fold wing tips under back (at first joint) - keeps them from flapping. Rub birds with olive oil. Mix dry ingredients and sprinkle on hens. Cook hens on barbecue grill over indirect heat for 45 - 60 minutes or until done. Chicken is done at 160F (70C) on your meat thermometer and/or the juices run clear when pierced with knife. During last 20 minutes of cooking baste with Barbecue Basting Sauce 2 or 3 times. When done, remove from heat, cut string and serve - don't forget finger bowls (it's messy) and bone bowls (to keep your plates tidy), additional Barbecue Sauce on the side. Or they can be baked in a shallow roasting pan in a 400F oven for the same amount of time - until done. If baking start basting immediately. Mix all ingredients except stock, in small sauce pan and bring to a boil over medium heat stirring frequently. Simmer 5 minutes, remove from heat and use as needed. Sauce will keep for a week in the refrigerator. Remove 1/3 cup Barbecue Sauce. Thin with 1/4 cup chicken stock.